Both of these guys are named Chris Conte. But only one of them is a professional football player. Chris Conte is a news reporter for WTVF, NewsChannel 5 in Nashville. Chris Conte plays safety for the Chicago Bears. They are two totally different people yet some Bears fans didn’t realize that Sunday night after Conte, the professional football player, was burned on Green Bay’s game-winning touchdown in Chicago. Let’s just say people weren’t happy with the football player and they let the reporter know about it Sunday night. A lot of the tweets directed Conte’s way can’t be printed on this website. They were just too vile. After a while some fans decided to have a little fun with the situation. #Bears @ChrisConte has to be the WORST safety of ALL time. You personally blew the Bears chances of the playoffs!
. 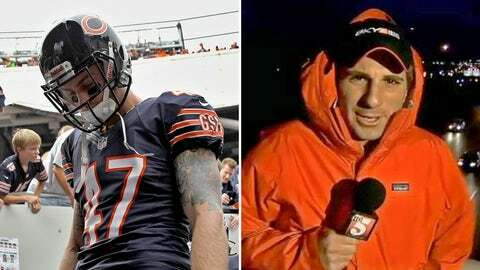 @chrisconte maybe if you focused on football 100% instead of dabbling in journalism my Bears would still be playing you JERK!!!! !